Riding in the car is an unavoidable mutual experience that you and your dog are going to eventually have together. It can be pleasant and fun or it can be a drag—it all depends on what type of car ride you make it. One thing is for sure: as a dog owner, it is your responsibility to learn how to keep your dog safe in the car. Much like humans, some dogs love riding in the car whereas others may experience motion sickness or anxiety. Our dogs depend on us to keep them safe, and it is our responsibility to make sure the appropriate pet safety measures are taken to protect them no matter where we take them or how we travel. There are numerous vehicular safety measures a dog owner must take in order to ensure that the pet has the safest ride possible. Contrary to the popular image of a dog riding in a car, sticking his head out the window happily without abandon, it’s actually a bad idea to let your dog be in the car unrestrained . 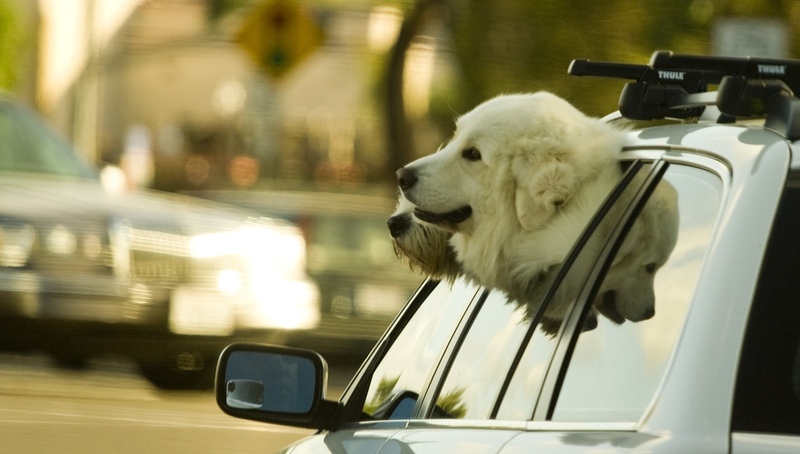 Even though dogs absolutely love riding with their head out to cool themselves , letting them roam freely in family cars and SUVs  has become a poor habit among many pet owners who honestly believe this practice to be safe. It's not. Allowing your dog to walk around in the back seat or sit on your lap up front without any restraints is dangerous for both of you and is a major distraction. You're placing your pooch at a high risk of being injured in case of an accident or even a simple sudden brake. Also, according to the AAA Foundation for Traffic Safety, looking away from the road for only two seconds doubles your risk of being in a crash, which is dangerous for both of you. Your dog needs to be restrained at all times while riding in a vehicle. “One reason to put a pet in a safety restraint is to prevent accidents. If pets are restrained, it keeps them out from under your feet while driving. Pets are also distracting; if you're petting them or looking around for them, you're not paying attention to the road,” – says Susan Nelson, DVM . There are three major issues that face a dog while riding in the car, and for each problem, there is a way to keep your dog safe and not susceptible to any injury. Reducing risk: How to keep your dog safe in the car? Keeping your dog restrained is the number one best preventative measure you can take to keep him safe while in the vehicle. Think of restraining your pet in the same way that you think about putting a small child in a car seat. You wouldn't let your toddler wander freely around the car, so why would you let your dog? Did you know that an unrestrained 10-pound dog in a crash at 50 mph will exert roughly 500 pounds of force, while an unrestrained 80-pound dog in a crash at only 30 mph will exert approximately 2400 pounds of force? Think about those numbers for a minute. If you're in a motor vehicle accident with your unrestrained dog, the incredible amount of force his body would exert while bumping and banging around inside your vehicle can cause serious injuries, and it would also put you and any other car passengers in grave danger. 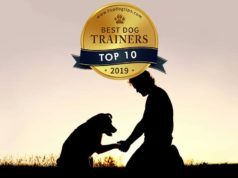 The most important thing to remember about how to keep your dog safe in the car is that there are numerous ways to restrain them, and you can try them all until you find the one that works best for you and your canine companion. An unrestrained dog is always considered to be a potential hazard for the driver and himself. Your dog can be a big distraction and taking your eyes off the road for just a couple of seconds greatly increases your risk of an accident. Your dog could bump the gear shift, the steering wheel, or other object in the car while roaming around untethered. Any of these mistakes could cause your control over the vehicle to be hindered. None of the above dog car safety methods will guarantee 100% that your pooch is safe. Some of these dog car safety products and protective measures are better than others, and all of them are better than nothing at all. Takes take a quick look at every option available on how to ensure your dog's safety while in a moving vehicle. One of the best ways to prevent any physical injuries of your dogs while you are riding in the car together is to harness them. This may not be your dog’s favorite option, but it is better than exposing them to all kinds of health risks. It's a less restrictive option, which is basically like a seat belt that is made specifically for a dog, and it even attaches to the car’s seat belt by a short tether. While the dog can still move, he won't able to wander around the backseat freely. A dog car harness keeps your dog from invading the front-seat area, and it's a safe way to still allow some range of motion while preventing injury at the same time. However, a research study conducted by Center for Pet Safety has demonstrated that dog safety harnesses are not always effective in protecting dogs upon impact . “Saying that these products prevent your pet from becoming a projectile in an accident is a potentially misleading statement. In our pilot study, the harnesses tested failed to keep the dog from becoming a projectile in a standardized crash simulation,” said Lindsey Wolko, founder and chairman of the Center for Pet Safety. It goes without saying that a safety harness for dogs is still much better than leaving a dog unrestrained, but if you can help it, you should probably explore other possible options to secure your pooch in the car. 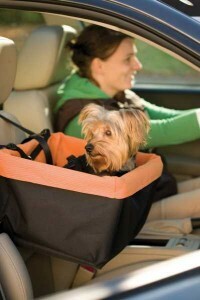 Crating is certainly one of the best methods to ensure safety of your dog in a car. If you have a small or medium dog, you can probably fit a crate right in the backseat. Many pet owners choose this option by default and they are not wrong. On top of keeping your Fido safe, you can also have his home wherever you go. Travel crates can be buckled into your car using the vehicle's standard seat belts, so in the instance of a crash, your dog is confined to his small space and the carrier isn't a projectile moving around your car. Likewise, if your dog is larger, the crate can go in the cargo area as long as the place it’s fitted in is not one that is likely to be damaged severely in case of an accident. The reason travel crates are such a good option is because your pooch will not feel as restrained in a dog crate as he would feel with a harness and seat belt. Additionally, you can use a variety of methods with crates to calm your dog down, such as using kennel covers for reduction of sensory stimulation. Dog booster seat is another great way to restrain your dog; car seats aren't just for humans anymore. Companies today are making comfy doggy car seats in order to keep your pet safely seated and restrained. They’re mainly used for small dogs that, like babies and toddlers, can fit easily. Most of these dog car seats look similar to a dog bed that straps into your vehicle via the seat belts and has a separate harness attached to the car seat that restrains your pooch. They are usually easy to install and provide your dog with a more comfortable place to enjoy the ride. Your pooch is still strapped in a seat and the method used should be relatively safe; however, it's difficult to make the claim which one is safer – dog crates or booster seats – as there were no crash tests done at the time of this writing. Personally, it would seem that booster seats can work better because they're safely attached to the car seat and the dog is attached to the booster seat. The only drawback is that you cannot use any calming methods with booster seats as you would with a proper dog travel crate. The final option that you have to protect your Fido in a moving vehicle is a dog car barrier. These car barriers can be metal, plastic or mesh. Depending on the size of your dog and whether or not you think they'll try to get through the barrier, you can choose what material you think will stand up to them. These barriers keep your dog contained to one area of the car, either the backseat or the cargo area. Barriers are not the safest form of restraint one can implement in their vehicle because your dog is still able to freely roam and may be more susceptible to injury in the event of an accident, but it is safer than having them moving around the entire vehicle. Plus, these dog car barriers will keep them from distracting you as well. Unfortunately, dog barriers for cars will usually work with SUVs, some vans and trucks only. If you choose a solid barrier, it's more than likely that it's not going to fit your smaller sedan. On the other hand, mesh car barriers for pets fit in most cars, but similarly to booster seats, we have yet to see any crash tests done with the use of pet barriers (either solid or mesh ones). Stress is a big deciding factor in how carsick your pooch with get, and if the first few car trips with him have gone poorly, he may have already made a negative connection between traveling in a vehicle and getting sick. Although this is observed rarely as we all know how much dogs love car rides. Car sickness is more prevalent in puppies and younger dogs because older dogs are steadier in the car for the most part. Luckily, there are several ways to prevent and alleviate your dog’s carsickness aside from using the above dog car safety products, like a crate or a booster seat. First, always make sure your dog faces forward while you drive so that they aren’t looking out the window wildly. Not only is it unsafe, but looking around out the car window in all directions while in motion is a common way to cause carsickness in dogs. Quick tip: Keeping your dog in a crate or harnessed while you drive will minimize nausea because they don’t have the freedom to move around and make themselves sick on accident. You can also help your pet by lowering your car windows a little bit so your dog can get fresh air, especially if the car trip is a long one. Being locked in an enclosed area for an hour or more can become unpleasant for a dog because their body temperature rises and it becomes increasingly more difficult for them to keep cool. Additionally, allowing your canine feel the breeze and fresh air will be calming and lessen his queasiness. Lastly, don’t give your dog too much pet food or too many dog treats before he gets in the car. While you want to make sure the car is a positive place for a dog, over-feeding him treats will only intensify the carsickness. If none of these tactics above help your dog to deal with car motion sickness, there are medications available that can help eliminate nausea in dogs [6, 7]. These come in the form of prescription drugs (for severe cases), anti-nausea medication and antihistamines. You should consult with your veterinarian before treating your dog with any of these medications. There are several behavioral training tricks to getting your dog to relax when they’re in the car. In severe cases where your dog's anxiety levels get out of hand, there are medications you can give your pooch to sedate him. Car rides are sometimes simply unavoidable, which is why medications is never out of question. However, before you attempt to use medicine with your pet, try to reduce his anxiety with behavioral modification first. Try this for relieving your dog's car anxiety. Sit with your pooch in the backseat while the car isn't moving and pet him until he is calm. If he knows you’re with him the whole time in the car, he may feel reassured. You can also help by using a dog travel crate with a cover to release stress. Additionally, give your dog toys to play with in the backseat or in the crate. Dog toys not only distract him from the car ride, but they are also a welcome reminder of home. Use positive reinforcement. Feed your dog a treat whenever he gets into a car. Dogs love treats and giving them one (but not too many) will help them build a positive association between the car and something good happening. If you show Fido that the car isn't a totally horrid place, his anxieties may lessen on their own. The inevitability of car rides with dogs doesn’t mean that the negative experiences have to be unavoidable as well. Dogs suffer from the same types of car problems as humans do, and how they manage them depends on the measures you, as an owner, take to. Make sure that your canines are safe, well-cared for and always protected. Pet safety is the number one priority when riding in the car for both you and your dog. For those of you wondering, we found a few videos of crash tests for dogs and how dog companies and pet safety organizations are testing dog safety products.